Skype Call Rates : Skype India 300 Callng Plan | Free Pc to Phone Calls, Free Voip Calls to India International ! Skype has always been a leader in the Voip market and the main reason for this is not its calling rates but simply it being quite an old voip service. It is widely used by so many people around the globe. It not only offers good voice quality and customer support but it also offers timely promotions. Infact it keeps coming with new voucher codes and promotions time to time. Another interesting this about Skype is availability of both pay as you go plan and unlimited calls monthly package. The calling rates of Skype have always been on higher side but still a lot of people use Skype. Skype Call rates are not that low but I would say that these are still competitive and some of Skype Calling Plans are worth trying. Skype even also offers free calls to some countries. Many of you must be using a Skype phone for your calling needs. And many of you just want to continue with Skype. So for those NRI who want to call India, Skype has got a deal for them. Lets see what does Skype India 300 monthly subscription plans offers to you. You will get 300 minutes of talktime to landlines in India. Effective rate gets to around 5.9 cents/minute (0.059 USD). I know the Skype Calling rate is very high. Call any time of the day, any day of the week. No long-term contract. The 300 minutes of Skype talk time run from the first to the last day of each calendar month. If you use up all of your minutes within one calendar month your next subscription purchase will be active from the first day of the following month. 300 minutes of calls to landlines in India and over 40 countries per month. Unlimited calls to landlines in over 40 countries worldwide (excluding India). If you prefer voice quality over call rates (Skype Call rates being high), want uninterrupted voice calls, own a Skype Phone then this Skype India 300 plan is surely for you! Try : Use Skype on Facebook or vice versa. With time and competition around, call rates do come down. So is the case with Skype. Its calling rates and plans have changed. Find below the calling rates and subscription plans for calling India. 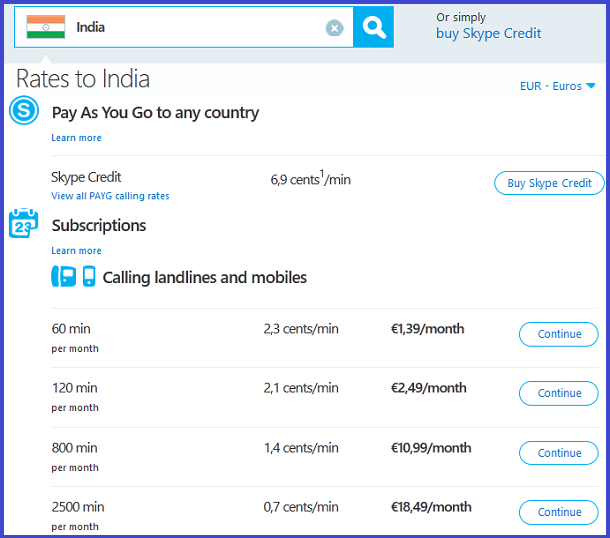 Skype Pay as you go rate to India is 6.9 cents per minute. It is way higher than what other voip companies offer. Subscription plans are like you can get 800 minutes for 11 GBP. Check the image below for updated rates. Or visit this Skype page to check its call rates to other countries. Good thing is you can use Skype on any device you have. It works on mobile, laptop, tablet, Television and even playstation. What skype keeps talking in this era of voip when you get appros 2800 to 3000 minutes to india for just USD 20 someting dollars with a very neat and clear voice quality. Who will go with skype? where skype is still living? As I have said in the post itself that Skype being quite a old voip provider, a lot many people still use Skype for their calling needs. This include both the domestic calling to USA and international calls to India, Pakistan. I myself have few friends in USA who use Skype for talking to their parents in India (well they have a skype phone and prefer it for its better voice quality). But the question is at this time, when so many other voip providers are offering equivalent voice quality (and some better too), and rates being much much cheaper than Skpye, Why will someone not switch to these voip providers. Why is Skype launching such costly plans ans still hoping to gain new customers. In my opinion people will certainly switch to other voip providers (may be after sometime). I live in UAE.Before I was Using tuitalker. Now in UAE Very strict. I have fear, if i use Hotspotshield Is there any way to fine me? I want to call (free of cast )to india,I'm not Rich Person. hi you have told that we get 2800 to 3000 minutes to call india with 20 dollars...can you tell us who offers this and also the website please? I am Indian and I live in Malaysia. Call rates from malaysia to India from malaysian GSM providers are way cheaper than Skype. So i prefer to buy a local SIM card when I am in Malaysia. And why should I use skype to call in India even when I am in India. A local indian service provoder's rates are 5 times cheaper than Skype. I would prefer to buy an Indian SIM instead. So moral of the story If you live in Malaysia or Indonesia or other nearby countries and you relatives are in India you never use skype, a total loss of business. What is skype doing? I live in AFGHANISTAN.Before I was Using tuitalker. Now in AFGHANISTAN Very strict. So please Any one tell How can i call india.